Competing signs at the Paw Paw school board meeting Wednesday night. People in the crowd wearing red t-shirts at Paw Paw High School celebrate the school board's vote. “We shouldn’t have to change who we are just to please some people,” Dwyer said. Members of the Native American community say the name is offensive, is connected with discrimination against them, and should be changed. “All they saw was the negative and we don’t have that negative,” Paw Paw alum Kim Jones said. Jones says her home was vandalized earlier in the day. She accused people in the audience of “crossing a line” by painting an “R” with a cross through it when she wasn’t home. The meeting was emotional at times, with a number of outbursts. Two people were forced to leave after interrupting the meeting. Kalamazoo resident Jaqueline Faust says her Native American children played against Paw Paw when they were in school and the name hurt them, deeply. 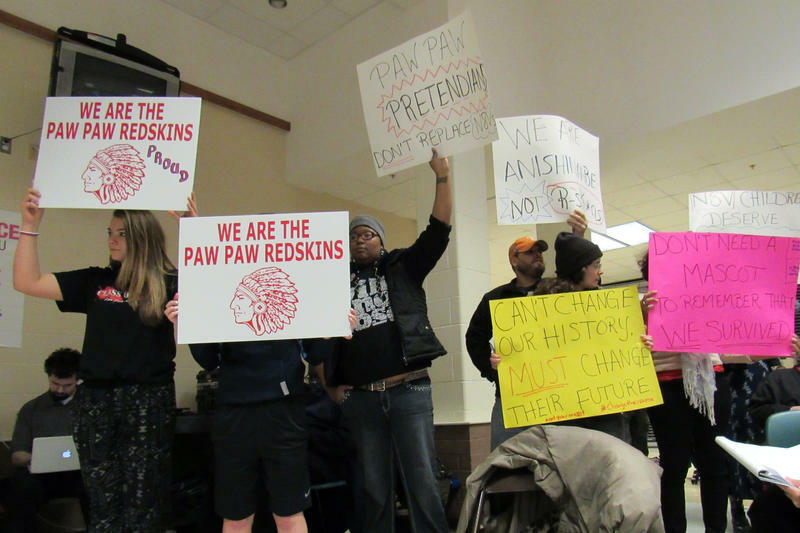 But Faust says keeping the Redskin name will also hurt non-native students in Paw Paw. Faust and others vowed to continue to keep pressuring school districts like Paw Paw to update their mascots. “I don’t’ think that they realize that this isn’t going to go away. All these people here are smiling and happy and laughing,” Tyler Westra, also of Kalamazoo, said. 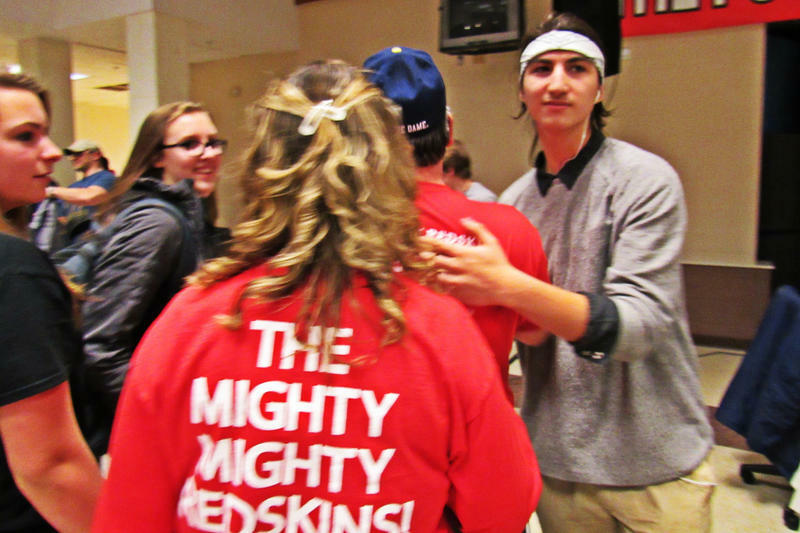 Westra says he was 15 when he went with a group to try to pressure Marshall schools to drop the Redskins mascot. That was more than a decade ago. He expects Paw Paw will too, eventually. “They’re judgment is flawed and their outlook is ignorant,” he said. The U.S. Department of Education has dismissed a complaint from the Michigan Department of Civil Rights over schools’ use of American Indian mascots. 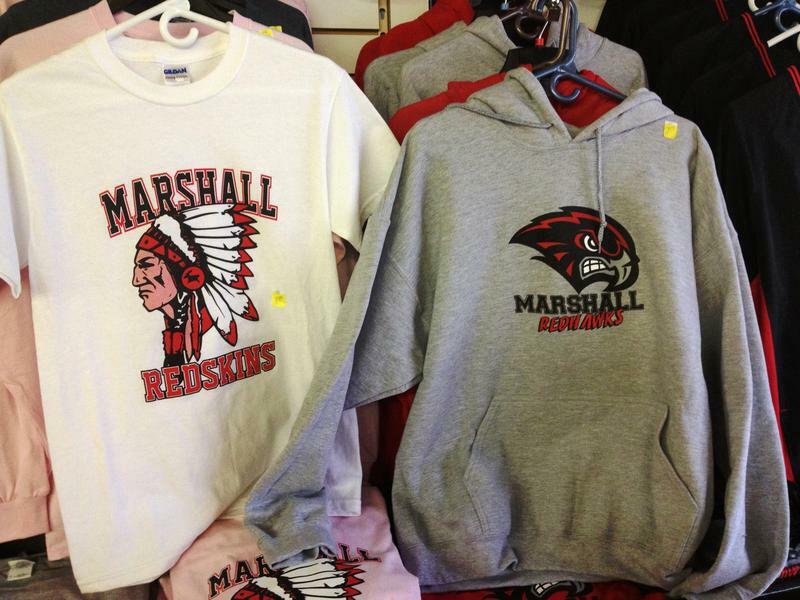 The civil rights department had argued that the images hurt Native American students’ academic performance, and create an unequal learning environment. But federal education officials say opponents of Indian mascots and logos need to prove that they create a hostile environment for Native American students. For years, the debate about using American Indian names and imagery for sports teams has centered on the question of whether they create a “hostile environment” for Native American students. Courts have been split on that question, and so has public opinion – even among American Indians.